Premium Lifestyles are expert Brisbane builders and designers of stylish and functional outdoor decks. We offer value for money and our decks are built to stand the test of time, and also the Queensland weather. Multi-Level Decks, Elevated Single-Level Decks and also Ground Level Decks. The Premium Lifestyles team will provide you with great deck design ideas and designs. Let your deck shield your privacy as you lounge in the sun. It can also serve as a great platform for celebrating special occasions with family or friends. Call 3300 0507 or email us today for a FREE in-home measure and DECK DESIGN. At Premium Lifestyles, we don’t impose boundaries on your ideas. We pride ourselves on thinking outside of the square and furthermore working within the limits that you set for us. Our expert staff are ready to help you create a deck where ergonomic comfort meets and merges with aesthetic pleasure. We can build with native Australian timbers and also imported hardwoods. 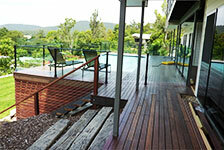 Outdoor decking lets you savor the taste of the typical outdoor Queensland lifestyle. Choose the style, colour, and also the shape of the ideal deck for your home. We have an abundant array of decking materials at Premium Lifestyles available. Alternatively you can tell us about a special decking product or material you’d like to incorporate into your new deck. Our range of affordable products includes the best available from the world market and we are always eager to find and test new materials. A deck with Premium Lifestyles quality is a unique feature that ultimately becomes an important extension of your living space and a valuable addition to your home. Get great patio ideas and designs: View the Gallery of our custom built decks. Premium Lifestyles are a leading Brisbane builder and designer that also offer you value for money and above all outstanding quality. Our team has over 25 years experience. We create patios, decks, pergolas, verandas, carports and weatherboard garages that transform your landscape into functional, stylish and appealing living spaces. Our expert team of professional trade and design staff have the knowledge and experience to conceptualise, plan, draft and also build simple and more complex designs according to your budget. Do you need a patio or deck for outdoor entertaining, pool decking or a new carport? We can help you improve the value, functionality and furthermore the liveability of your home or commercial property. We offer a 7-YEAR WARRANTY and every one of our premium structures is also built to last. Premium Lifestyles are OPEN 7 DAYS and service ALL Brisbane suburbs including Brisbane North, West, East and South. We also service areas within a 100km radius of Brisbane such as Gold Coast, Ipswich and Sunshine Coast. Contact us today so we can create your dream deck!